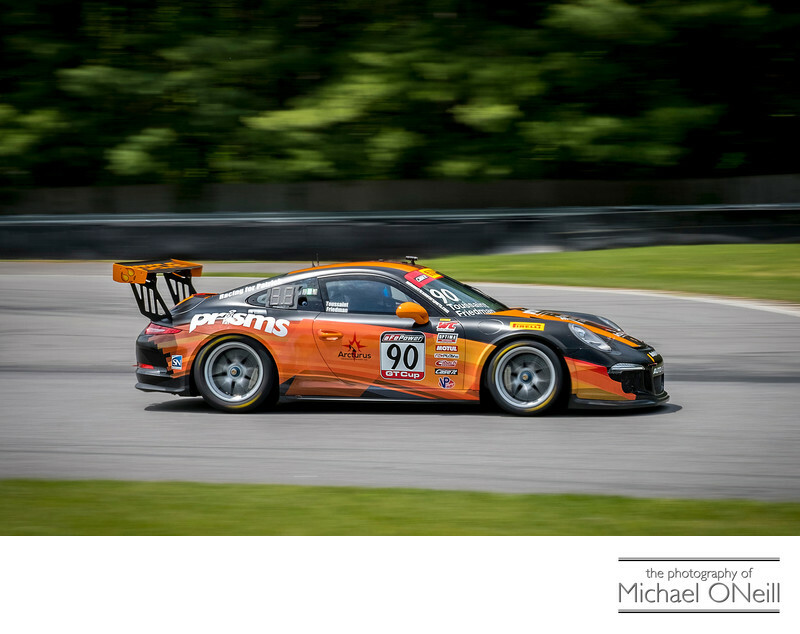 This picture was taken at The Pirelli World Challenge (PWC) at Lime Rock Park in Connecticut on memorial Day weekend of 2017. While charging down the back stretch towards the turn known as West Bend, this outstanding Porsche race car was photographed using a motion blur technique to capture and convey the sheer speed of this machine. The Pirelli World Challenge has been around for 28 consecutive seasons as of this writing and growth of this series continues. Last year the SprintX class was added to the series which already included the numerous GT and TC divisions. Lime Rock is one of the most beautiful motorsports parks in the world. Nestled in the hills in the Northwest corner of Connecticut, with the Housatonic River running through the property, parallel to the front stretch; Lime Rock offers one of the most laid back spectator experiences in the world. Guests to the track camp in it’s infield in tents and million dollar motor coaches alike. Parking corrals for individual spectator owned cars (Porsche, Mercedes, Lotus, Ferrari, Corvette, etc) are set up and car owners can congregate with others with similar tastes and interests. If you are looking for a photographer to cover events in the Northeast United States give me a call. In addition to Lime Rock Park I have covered events at Watkins Glen, New Hampshire Motor Speedway, New England Dragway, Old Bridge Township Raceway Park, Thompson Speedway Motorsports Park, Stafford Motor Speedway, Riverhead Raceway and New Jersey Motorsports Park. I am available for assignment at any of these tracks, which are "local" to my East Northport, NY studio; or at any other venue worldwide. Whether you are looking to have the live action captured and preserved or if you are embarking on any advertising or public relations programs I am here to work with you to get you the dynamic images you need.